There’s a good reason for the thin crowds. On the rainy night of June 8, an unidentified person hurled an acid-filled bottle from a Mongkok building onto pedestrians below. It was the third acid attack in the neighborhood in six months, and it left 24 passers-by  including a four-year-old girl  with skin burns to their faces, shoulders, limbs and feet. Sammy Chan, a salesman at a shoe store across the street from the crime scene, said one family from the Philippines ran into his shop to throw water on their wounds. Five of them went to the hospital. It’s a bizarre serial crime by any city’s standards, but especially for one with a relatively low crime rate on paper. While drug offenses have been up this year, Hong Kong police say the majority of all other reported crimes dropped several percentage points. In last year’s Global Peace Index, a yearly listing of nations’ peacefulness by Vision of Humanity, Hong Kong ranked a serene 23 out of 140. Yet when violent crimes occur, they can be exceedingly gruesome. This month, for instance, a mentally ill man was convicted of randomly butchering a three-year-old boy to death. In March, a man beheaded his former girlfriend for ending their relationship. “Any person with a sane mind would not do things like that,” says Regional Crime Prevention Officer Peggy Yip. In a city where a lot of people share a very little space, violent crimes leave a lasting impression on the population  and the police. After Mongkok’s last acid attack, which occurred May 16, police installed eight CCTV surveillance cameras on two buildings in the area to try to catch the culprit the next time he or she struck. But after spending about $220,000 on the equipment, none of the cameras’ footage caught this week’s attack. 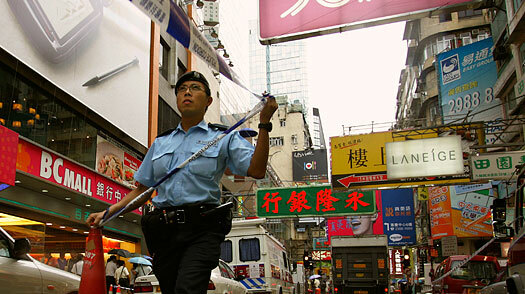 Senior Superintendent Edward Leung Ka-ming of the Kowloon West regional crime unit said the collected footage needed to be “enhanced” because of its poor resolution to prove useful. While the district council decides what step to take next with the cameras, the police hope pedestrians might have some tips of their own. A large police van parked near the latest crime scene has posters in Cantonese and English offering a reward of over $37,000 for information. In the meantime, dozens of policemen now roam Mongkok’s normally chaotic streets  ubiquitous reminders that the neighborhood remains on alert. Circle Lo, an employee at a clothing store next to the attack spot, says she has noticed the drop in foot traffic and hopes business will return to normal within a week. But not everybody seems concerned. A LensCrafters employee, identifying himself as “Jacky Chan,” works a only a few feet from where the bottle fell. “Some of the people who got hurt sat down,” he said, “but it was like nothing happened.” Perhaps, but judging by the pedestrians still looking up for a lurking villain two days after the attack, the mood in Mongkok is definitely down. See 10 things to do in Hong Kong. See pictures of Hong Kong.